Posted November 28, 2012 by Josette Farrell in Events. 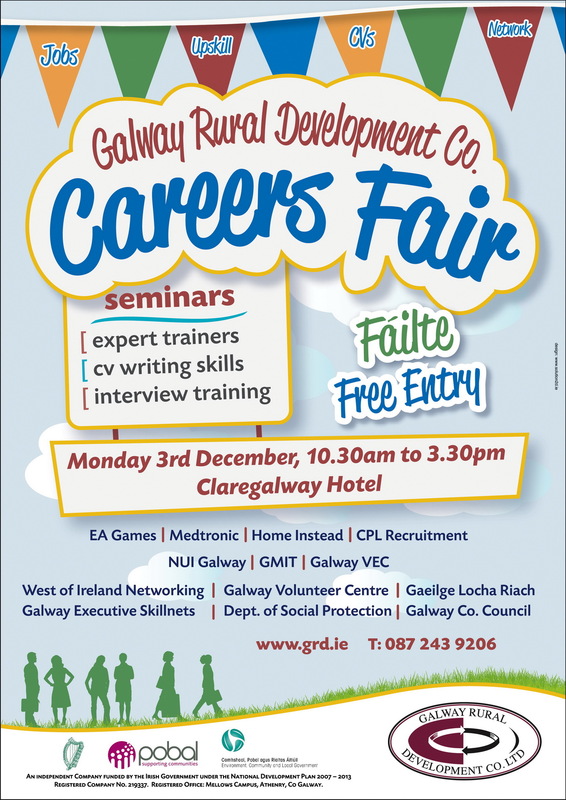 A Career’s Fair organised and hosted by Galway Rural Development Co. will take place in the Claregalway Hotel on Monday 3rd December from 10.30am to 3.30pm. Representatives of some of Galway’s largest employers and recruitment companies will be present among them EA Games, CPL Recruitment, Medtronic and Home Instead. Representatives of Galway’s educational and training institutes including NUI Galway, GMIT and Galway VEC will present attendees with lots of career and training options. The Electronic Arts Worldwide Customer Experience Centre Galway provides international player support, serving a global customer base 24/7 across a range of EA games and services and in multiple languages. EA recently announced the addition of 300 new roles to be recruited as the Galway team builds to capacity, including Customer Support Representatives, Management Roles, Training, and IT among others. To find out more about EA in Galway visit www.jobs.ea.com or come along and meet them at Galway Rural Development Careers Fair. Galway Rural Development (GRD) unemployment mediator Adrian Feeney and Back to Work Employment Allowance Officer Michael Burke will be on hand to provide advice and information on the variety of assistance GRD can offer people who are unemployed and low income earners. Other organisations present on the day will be the Dept. of Social Protection, West of Ireland Networking and Galway Executive Skillnets, Galway Volunteer Centre, Gaeilge Locha Riach and Galway Co. Co. Expert trainers will provide seminars on CV writing skills, job interviews and network your way to a new career. These will be provided free of charge, however spaces are limited. In the current climate being well prepared for a job interview is a key to your success in securing your next job offer. Valuable tips and advice will be given during these seminars. income earners to increase their job prospects through training, education and supports. One of the aims of this event is to provide support to people who are seeking work, be they recently made redundant, long term unemployed or recently graduated from college. Members of the public are invited to attend.